I eat meat. Kenan and I decided that if we were going to eat meat we needed to either raise it ourselves or get it from a farmer that we knew, one that raised the animals with care for the environment, the soils, and the animals themselves. We respect those that have chosen a different diet, but believe that moderate meat consumption is more ecological sound and sustainable. We raise chickens and lamb in a humane, responsible manner. The industrial model of raising animals, in confined animal feed operations (CAFO), is not ethical nor sustainable. This meat accounts for almost 99% of all meat. It is cruel to the animal, produces a meat that is not healthy and is antibiotic dependent, and is an environmental travesty with the concentrated waste produced, and the chemically dependent grain used as a feed. Pasture raised, grassfed meat is high in omega-3 fatty acids, beta carotene and vitamins E and low in saturated fat. Livestock raised in an ethical environment must have access to their natural foods, clean water, shelter, protection from predators and room to move in a natural habitat. For pigs it might mean mud, for chickens they need to scratch in the soil. Sheep, cows and goats need a variety of forage eaten while roaming, usually from rotational grazing. The earth’s ecosystem is supposed to have plant and animal impact with the soil. The animal manure feeds the microbes in the soil that develop the fertility needed for plants to grow nutrient dense food. The impact of the hooves or chicken feet aerates the soil and the grazing animals can turn grass and forbs, inedible to humans, into food. Few inputs are necessary for this type of animal husbandry. We do not have to buy and truck in fertilizer and herbicides. Many of the ethically raised animals are raised on land unsuitable for raising vegetables and many others are used in a rotation with vegetable plantings, like we do at Laughing Frog Farm. Ruminates have a unique ability, with the help of sunlight and water, to turn hundreds of different naturally growing plants into protein while monoculture crops need tractors, fuel and fertilization, to produce their nutrients. Many vegetables and grains are raised using environmentally destructive methods. In order to grow vegetables we need to add fertility to the soil. The use of manure has traditionally been the farmers go to solution, but with the advent of chemical fertilizers, animals became unnecessary because the farmer can now purchase the fertility. Heavy use of these chemicals is causing polluted water, interrupting the soil food web, and creating dead zones in our oceans. There is evidence that these chemicals are chelating the nutrients in the soil and consequently reducing the nutrient levels in our food. Compost can add some fertility, but it alone will not provide the nitrogen needed for healthy crops. Many organic farmers turn to cottonseed and alfalfa meals that have been produced, usually, with chemical fertilizer. Furthermore, most of them are now genetically modified, meaning large doses of chemical herbicides have been used, further robbing our soil of its nutrition. Fish emulsion is used extensively in organic farming to raise nitrogen levels. Those fish were often fed GMO corn and soy and, of course, dead fish are not a particularly good vegan option. These amendments are trucked across the country powered by fossil fuels. Most alternatives to manure, for fertility, have limited availability and high costs in the developing world. Nitrogen fixing cover crops, vermicastings, mulches and compost tea all are alternative fertility solutions that we use, but most require energy, and labor. Most of the farm animals would become extinct if farmers quit raising them. These animals have been developed over centuries to provide meat, milk, wool, leather and eggs to humans. Goats, sheep, chickens and cows are not prepared to live in the wild. Pigs have proven they are prepared and have become a nuisance in many parts of the country. Eating requires taking a life. People just choose where to draw the line. A cabbage is alive. We kill cockroaches and mice. “Vegetarians” often tell me they eat fish or shellfish. Modern vegetable agricultural methods eliminate earthworms, starve monarch butterflies and interrupt the migration of birds. We know that plants communicate with one another through the soil and that plants have a survival instinct as they struggle to stay alive in bad soil or weather conditions. Animals are truly an integral part of sustainable agricultural systems worldwide. Of course, we can always raise animals just for their manure and not their meat. Many aquaponics operations utilize goldfish and horse manure is an alternative, as are zoos, though not part of a sustainable agricultural system. Some farmers use animal power as an alternative to tractors but a two oxen will not fertilize a whole farm. If all animals are to be raised in a pastured, humane way we have to eat less meat and seek out the best places to purchase it. At this point humanely raised, pastured meat is seldom available in a supermarket or a restaurant. Organic, cage free and natural do not mean responsibly raised or humane. You are what you eat and you are what you eat eats. If your chicken was fed pesticide ridden corn or your farm raised fish was eating GMO soy it will affect the quality of the meat and the quality of the manure we use as fertilizer. Also if your soil was fed chemicals that limit a plant’s nutrient uptake it will affect your health as well. I honor people who make moral and ethical decisions about how they eat, whether they chose vegan, vegetarian or omnivore. Remember that the food that nourishes your body is a precious investment in your future. Don’t eat the cheap, fast and easy American diet. Don’t be cheap, fast and easy. It is late January and this is the busiest time of the year for this farmer. I am starting to plant spring broccoli and pak choi, 1500 tomato plants need to be bumped up to 3″ pots and the hoop house they are going in needs some repairs. I am potting basil, separating lemongrass and grafting persimmons. In a couple of weeks I will begin grafting citrus. Right now is the time to prune all the dormant fruit trees and grapes. I have to keep my baby chicks at 95˚, which is sooo easy in the summer, but today it requires some extra monitoring. It is lambing season and though the Gulf Coast Native ewes do all the work, giving birth on pasture, cleaning them up and nursing them, we spend some time weighing the babies, recording info, tagging ears and monitoring the mamas’ health. And heck–just looking. That’s what the blue chairs are for. I consider that work. Nursing ewes are always requesting some alfalfa pellets and they drink a lot of water. Yesterday morning the hoses were frozen, making me truck water from the house. It was only 29˚ and they were thawed by 9:00. The weather has been glorious this winter. Fruit trees are selling out, we are running low on lamb meat and the broiler chickens will be sold out before the new ones are ready. Add to that the fact that the sun is only up about 10 hours a day. Ten beautiful hours. In the north winter is a time to sit inside as much as possible and plan. For me that would be August. 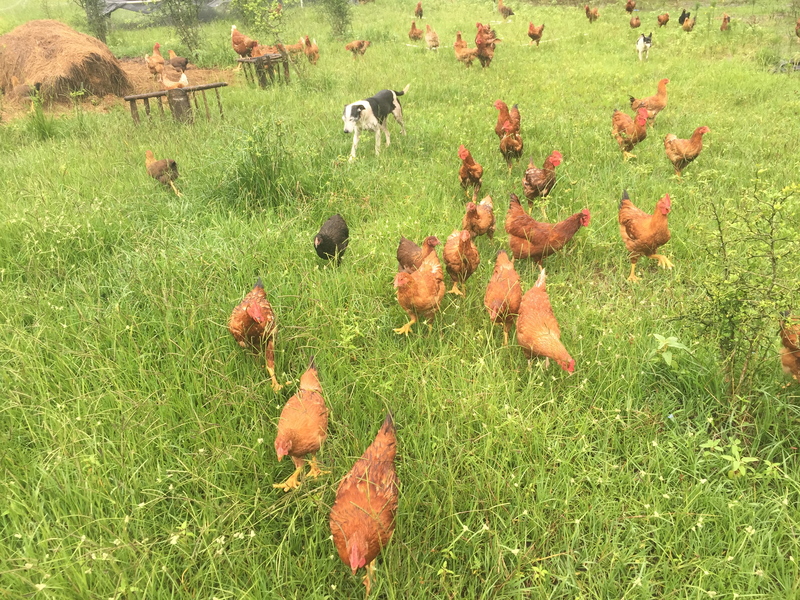 I will also have whole, pastured, organically fed, freedom ranger chickens, raised by the “Label Rouge” production standards, a grassroots, chef and farmer driven program the French introduced in response to the factory chicken.